On Jan. 3-6, more than 300 attendees from around the globe converged at Hilton College for the 24th Annual Graduate Education & Graduate Student Research Conference in Hospitality & Tourism. The event is held here every other year. Kudos to event co-chairs, Drs. Yoon Koh and Juan M. Madera, with support from Associate Dean for Research and Graduate Studies Ki-Joon Back, for putting together another hugely successful event. Of the four awards for Best Paper, Hilton College garnered two. 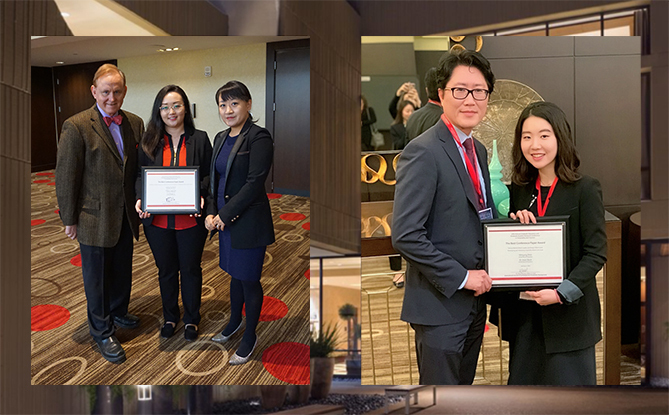 The first, “Time to rethink brand loyalty and bring in brand love: developing and validating hospitality brand love scale,” was written by doctoral candidate Min Jung Shin, pictured right with Dr. Back, her advisor. The second, “The effect of nature immersion on the pro-environmental intention: the mediating role of self-control by doctoral candidate,” was presented by Jookyung Kwon, with Drs. Tiffany Legendre and Carl A. Boger as advisors. Dr. Dogan Gursoy, Taco Bell Distinguished Professor at the Washington State University School of Hospitality Business Management, received the University of Delaware Michael D. Olsen Research Achievement Award. The Founder's Award, presented by Dr. Kaye Chon, went to Dr. Zvi Schwartz, chairperson and professor of Hospitality Business Management at the University of Delaware. Since its inception, the conference has grown to become the most competitive hospitality research forum for graduate students in the world. It is the ultimate platform for the exchange of cutting-edge research and networking, as well as serving as a career mart for graduate students completing their terminal degrees. The 2020 conference will be hosted by the William F. Harrah College of Hospitality at the University of Nevada, Las Vegas on Jan. 2-4. Click here to see event photos on Facebook.